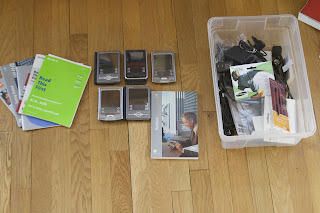 The five PalmOS devices shown above are probably 1/2 to 1/3 of the total Emily and I bought between 1998 and 2006. I underwent the exquisitely painful Palm to iPhone transition in Aug 2008 (in some ways it's still continuing). I don't think anyone will want the devices, but the chargers and accessories might be of interest. I have zillions of styli. One SONY made device uses AA batteries. It's the only one that would still work; I might keep it around for grandchild show and tell (I bet there's still an AA equivalent in 30 years. If there's civilization.) The others had LiOn batteries that are pretty dead by now. Ahh, Palm. They were great in their time, but they peaked in the 90s with the Graffiti One Vx. Even after they lost their way, the company was sustained by some terrific developers like Pimlico Software (DateBk). They fell of a cliff in the past week or so. I assume the price was being sustained by hope of a Nokia or Microsoft acquisition, but that news of Windows Mobile 7 made that unlikely. Instead the key people are likely to go to Microsoft or Google and someone will buy up any useful patents. Update: Details on the sad future from Gasee (via Gruber). Update 3/23/2010: The best pre-iPhone smartphone was the PalmOS Classic Samsung i500. Also, the Palm Vx pioneered the non-removable LiOn battery. Update 3/24/2010: My coworkers took almost every accessory, but nobody wanted a device. I love Minnesota -- the home of geeks who hate throwing things away. It's such a strangely difficult platform to give up. I've got 3 of them still floating around that I can't seem to part with. They were delightful in the 90s. There are still things the Palm Vx did well that my iPhone struggles with. I loved the incredible speed and instant on performance -- that's been lost. In the old days they NEVER crashed, never needed restarting. I restart my iPhone every week or so. My DateBk Palm calendar was far more powerful than anything I have now. However now I share calendars with my wife and with work -- and that's a qualitative improvement that outweighs all we've lost. I was sure I would be the very last to let go, but I made the move a few weeks back after 13 years (1997 with the 2nd Pilot device, then another, then a few Vs, then a Zire, then a TX, then a Centro phone). Data is still in transition, and I sorely miss HandyShopper - GOD do I miss HandyShopper - but I think it will get better eventually. Gordon, thank you for your insights; they were immensely helpful. I had to do a Visio flow to map out data sources and endpoints before I could make the leap (syncing calendar and contacts only at work, the rest at home, no calendar solution at home YET with Windows desktop - guess I could do Outlook, but oh the pain of losing the old Desktop). 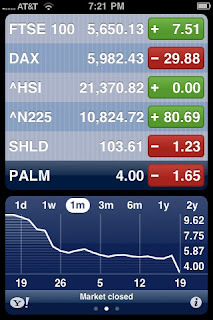 RIP, Palm. I loved you well. Hi Palmfool. We Palm veterans should have some sort of support group. We use Google Calendar as our personal calendar and currently sync to it using CalDAV (since I do Exchange to Work I couldn't use it for home calendar). It's working very well. I missed a big, big miss. I'm on the knife's edge of wanting to sell the iPhone (or give it to my 17 year old) as a result. WHO would have thought that in the requirements / gap analysis between Palm and iPhone, I should have included this: "search for data". - Can't find a contact unless you know the first name, last name, email, or company. Title doesn't even work. If I knew those fields, why would I use SEARCH? It's a fatal flaw for someone who has always taken copious notes on contacts and expects to find them based on an acronym, a single word embedded in the notes, etc. Any idea if 3rd parties will be allowed into Calendar or Contacts any time soon?? I feel your pain Palmfool. No search against contact notes is particularly painful. The database-centric file structure of PalmOS made search a pleasure to use. The usual adaptation is to do that search on the desktop (sigh) or the web (google calendar, contacts). Before you sell though, confirm that the alternatives are better. That means Droid of course, I don't think RIM is going to last. Apple is providing a calendar API with release 4. I think there's a contacts API too. I wouldn't hold your breath for a fix though. Basically, we PIM-geeks are refugees now. We can't be too picky. The world has moved on, and has little sympathy for the features you and I want and need. 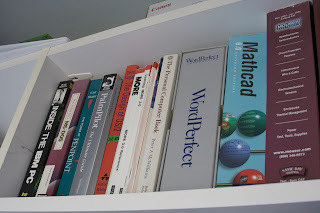 Progress in computing was only unidirectional in the 1980s and early 1990s. Now it's quite a bit more violent in all directions.